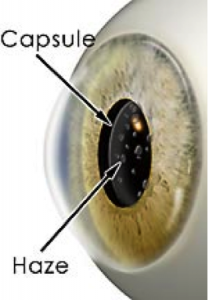 After cataract surgery the remaining portion of the capsule is likely to become cloudy and and the patient can experience symptoms similar to those from the original cataract. For this reason, Posterior Capsular Opacification is also known as secondary cataract. Your ophthalmologist can diagnose posterior capsule opacification during a routine eye exam using a slit lamp microscope. The condition is more easily detected if the pupils are dilated. Posterior Capsular Opacification can be treated with a simple procedure called a YAG posterior capsulotomy, which restores vision lost from the clouded capsule. The YAG is a type of cold laser used to create a small opening in the center of the capsule, allowing a clear area for light to enter the eye. The procedure is painless, requires no anesthesia, and has very little risk since no incision is required. After the dilating drops wear off from the procedure, most patients notice an immediate improvement in vision. The improvement each person experiences is dependent on the extent of the capsular clouding and the overall eye health.